Puzzled about what to view for your next family movie night? 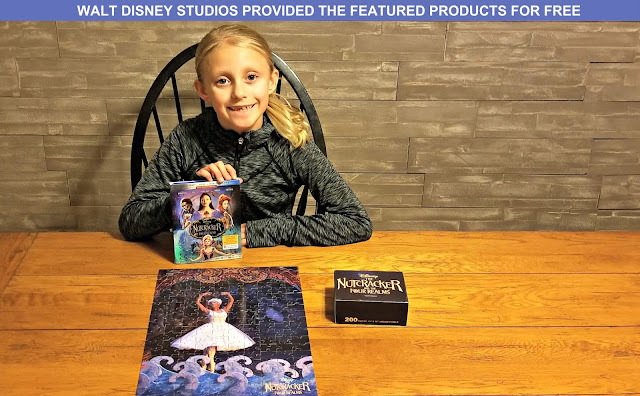 National Puzzle Day brings us the Blu-ray and DVD release of THE NUTCRACKER AND THE FOUR REALMS. This is Disney's live-action adaptation for the well-known ballet which portrays the story with spellbinding imagery transporting audiences to a colorful fantasy world. My daughter who has been dancing ballet for several years now enjoyed the film's performances by Misty Copeland as the Ballerina Princess while her brother appreciated the adventurous aspects of the movie, especially the battle scenes that include sword fights and life-sized toy soldiers. Walt Disney Studios kindly sent us a 200-piece jig saw puzzle along with THE NUTCRACKER AND THE FOUR REALMS Blu-ray+DVD+Digital combo pack to commemorate the National Puzzle Day home entertainment video release of the movie. 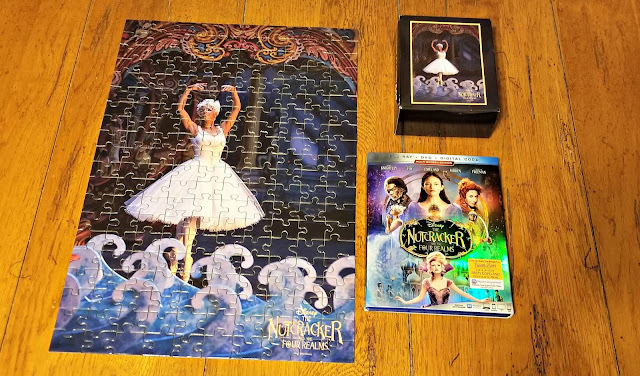 With a polar vortex putting our neighborhood in a deep freeze, we had a fun evening putting together this puzzle showcasing Copeland as the Ballerina Princess on our dining room table after supper followed by bundling up in blankets together on the living room couch to watch THE NUTCRACKER AND THE FOUR REALMS for an impromptu family movie night. It was a nice movie to watch at home on a cold winter night. Disney's film is loosely inspired by E.T.A. Hoffman's short story "The Nutcracker and the Mouse King" written in 1816 and Alexandre Dumas later adaption of this tale titled "The Story of a Nutcracker" which were later turned into a ballet by Pyotr Ilyich Tchaikovsky in 1892. There is a wonderful dance sequence during one scene in the movie but THE NUTCRACKER AND THE FOUR REALMS is more focused on portraying a fantasy adventure than recreating the ballet on the big screen. For some that may be a disappointment and others a blessing. Copeland's performance joined by Ukranian dancer Sergie Polunin though does provide a nice connection to Tchaikovsky's ballet whose holiday time performances have become an iconic part of the Christmas season without making dancing a mainstay of the movie's plot. The movie is set in Victorian England starting with a father giving his children Christmas presents his wife had set aside for them before she died. His youngest daughter, Clara, receives a handcrafted egg-shaped box that she is unable to unlock. In her quest to unlock her present, Clara becomes transported to a parallel dimension that consists of four realms. The girl discovers that her mother created this magical place populating it with toys that were brought to life. Unfortunately, the four realms are in a state of turmoil and war and Clara is tasked with bringing peace and stability as the heir to this fantasy world's creator. The key to solving the dilemma she is confronted with is being able to open that mysterious Christmas present. Clara thus takes part in an adventure to restore harmony to this land and get back home to her family in England. THE NUTCRACKER AND THE FOUR REALMS is rated PG for some mild peril. As a parent, I appreciated that the movie promotes Clara's interest in science, engineering and tinkering with mechanical things highlighting important STEM themes for kids. It also has valuable messages for children that can be taken away from the story such as learning from one's mistakes, the value of self-confidence, and the importance of perseverance which make it a good film to view for a family movie night. 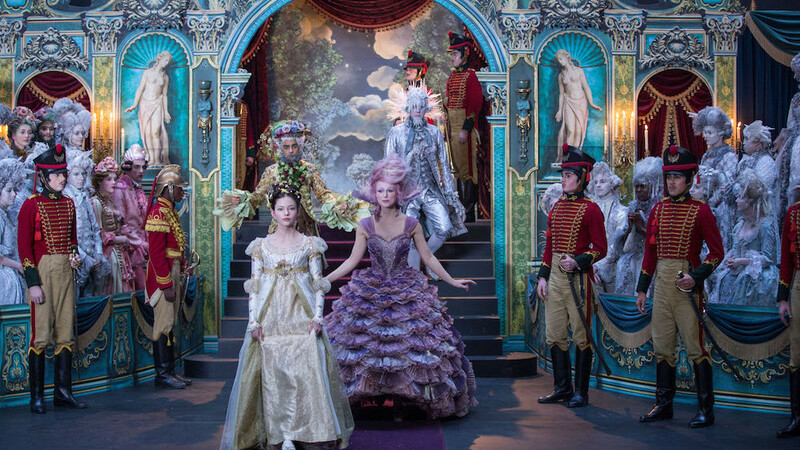 Because of these educational elements presented within an entertaining story, THE NUTCRACKER AND THE FOUR REALMS gets A Geek Daddy nod of approval. The fact that my daughter was delighted by Copeland's dance number factored in to this movie getting a good review too. oh my gosh my daughter would love to see this movie- def up her ally with ballet and disney ha! so excited to share it with her! Thanks for sharing this information. My nieces would love this. I can't wait to see the movie!! We missed this movie while it was in the theatres! We will definitely need to catch it on home entertainment. I'm excited to see what Disney have done with this movie. It sounds like a really interesting take on the nutcracker. So I'll be honest and say I wasn't a huge fan of this movie, but I loved all of the sets and costumes. And it's definitely a fun way to pass the time while we have this winter weather this week. I still need to see this movie. I'd be fun to watch it and put the puzzle together at the same time. I like to do two things at once. Glad your daughter enjoyed both. Such a classic! I took ballet as a child and performed The Nutcracker numerous times, so this film holds a special place in my heart for sure. I really wanted to see this before Christmas but things happened and I never got to. I need to buy it! I need to see this movie. I loved the previews! I have seen the Nutcracker every year since 1989. I haven't seen this movie, but have seen the ballet. This looks like a feast for the eyes! Can't wait to watch it. I saw this Nutcracker in theaters and I LOVED it!! I'm a huge Nutcracker fan anyway though so I'm sure that influenced my opinion! LOL! I love that puzzle you guys completed. I have never watched the Nutcracker, must be fun. This is the best excuse to watch The Nutcracker and the four Realms at home all together with a lot of pop corn! That puzzle looks like so much fun! I cannot wait to watch this movie - didn't get a chance to watch it in theatres. I saw the trailer of this movie and it really looks like a good one. Well, if it's from Disney, it must be good. Looks beautiful! Thanks for the reminder - we were meaning to see this! It looks like a wonderful movie! This is such a great idea to introduce a classic to the kids. Love the puzzle idea. I have this one as well. I was thrilled to be able to see it. I just love the way they made the costumes and everything. So beautiful!